I found a really nice reference picture of the yellow-orange-green Trandoshan with a pear-shaped head on KW Miniatures blog. 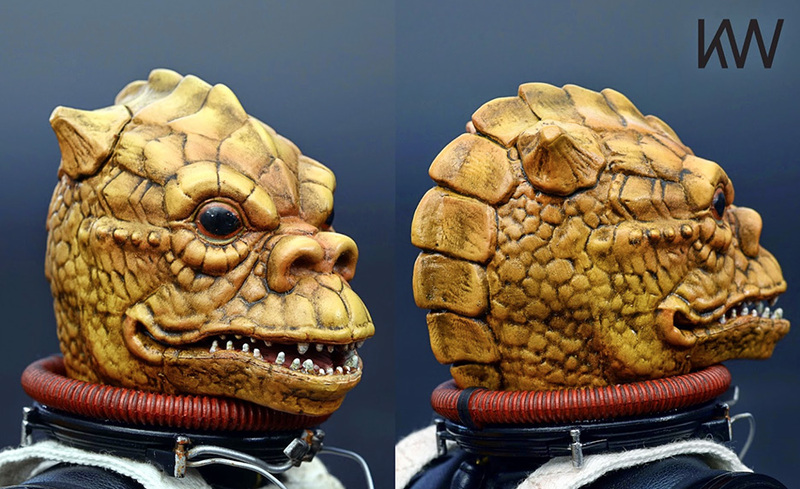 It is a beautifully custom painted Bossk figure – you should definitely click on the link to see Kong Woon Soon’s work. Bossk Pears are of course beast eaten with Blue Cheese Death Star Ball or Imperial Fleet Hors d’Oeuvres. Mix a couple of drops of red and yellow food coloring on a plate (tooth picks are great for mixing). Roll the top and sides of 2 sugar eyeballs in the mixture. Wash and carefully dry the pear. Using the food marker, mark the position of the eyes. Cut small holes with a knife, and push in eyes (and dab any excess food coloring with paper towel). Draw mouth and nose, then add any reptile texture or details you might want. Add the rice grains for teeth. Cut a paper towel core roll to about 2-3”tall. Cut white fabric (we used fleece) the size of the circumference +0.5″ x height of the roll +1.5 “. Cut the burgundy fabric the size of the circumference +0.5″ x 2.5 “. This works GREAT as a dinosaur too. 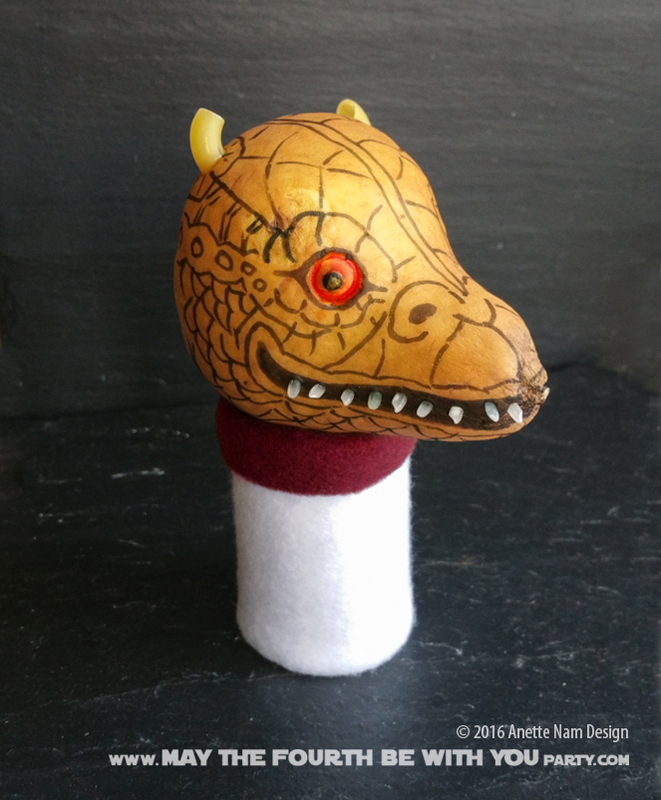 My son doesn’t know who Bossk is, but was just beside himself with excitement when he saw I was making a dinosaur head out of a pear! It lasts pretty well. We kept it overnight, and the eyes had started dissolving by the next morning… which was of course loads of fun for the kids! (ICK!) But it can easily sit for a day.